Make your special day one to be remembered by saying your vows amongst the fiery sandstone of the Valley of Fire. The Valley of Fire is the perfect place to celebrate your special day. Discover the beauty of the Southwest that this destination ceremony provides. 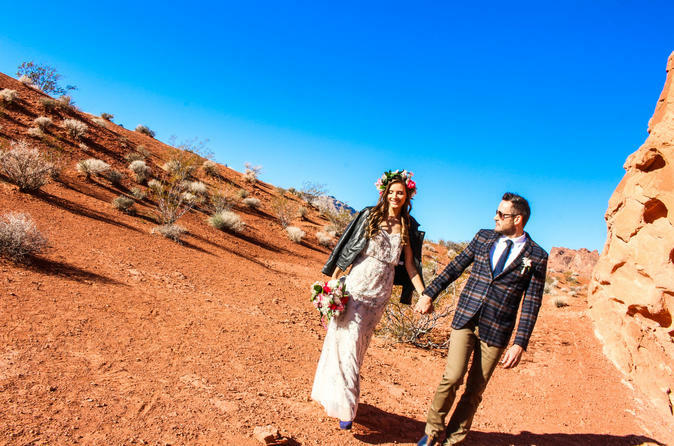 The Valley of Fire is a short drive away from the Strip and it is a very popular and beautiful place to say " I DO" and celebrate your Las Vegas Ceremony. Imagine spending a day with your loved one surrounded by the Red Rock sandstone of the Valley of Fire. Along with your minister and professional photographer, a special day is sure to be made. Your day will start with a luxurious limousine (or Escalade if option selected) picking you and your fiance up from your hotel on the Las Vegas Strip. Enjoy a scenic drive to the Valley of Fire admiring the views along the way. At the location the bride is presented with a fresh rose bouquet and a boutonniere for the groom. There are three different packages to choose from to suit your budget and needs.